Over half the primary-age children in Africa– 40 million of them – don’t go to school. More than 70% of secondary-age students don’t attend. Many African parents can’t afford to send their children to school or to pay for their mandatory school uniforms. Sometimes school is held out-of-doors, which must be closed during the rainy season. Sometimes there are no schools at all. Normally, there are few, if any, books or school supplies. Reach the Children supports a higher quality of education in existing schools by supplying research, resources, and assistance in facilitating community-parent-teacher interaction. They help more children to enroll and stay in school by training teachers to be more effective, offering scholarships to cover school fees for orphans and underprivileged children, assisting in the construction or improvement of new and existing schools, and by providing school supplies, books and computers at very low or no cost to various schools. By taking a community development approach, needs are identified by the members of the community. At times, a replacement roof is needed. At other times, supplemental training for teachers may be requested. Reach the Children helps the community find solutions to these challenges and facilitates maximization of local resources. Reach the Children coordinates with in-country leaders to determine which children and schools are in need of assistance. Supplies and/or funds are distributed to the schools and accounted for by Reach the Children’s in-country leaders. Many Americans have traveled to Kenya on Reach the Children expeditions to build schools and train teachers. Education programs are tailored to specific geographic areas and facilitate community-parent-teacher interaction to better serve the educational needs of the students. For example, the Kwa Watoto school in Soweto has combined community resources with education grants to help create a good school environment for poor children. Reach the Children is also concerned with the lack of health care in Kenya. Many children die each year of preventable diseases. Many do not understand how to use proper hygiene to avoid disease. Educating community members about health topics is essential to overcoming poor health conditions. Health expedition teams travel to Africa to present new techniques to medical personnel and provide immunizations to children. Training of local personnel is a key element to an on-going solution. The health expedition teams always incorporate local health care providers in the interactions with program participants so that knowledge and skills can be passed on in a practical, grassroots setting. Reach the Children also promotes health clinics in schools and community centers. We provide for yearly renewable scholarships for secondary school. We follow up on the child’s performance through the guardians, and open a communication with the child by writing letters to the children to see how they are in school. We also organize for an annual get together for the children and their sponsors so that they may meet and the children can share their experiences. Under the school fees initiative, orphans and vulnerable children need to meet the following requirements to qualify for the sponsorship. The scholarship renewal depends on availability of funds and the student maintaining a B average. b) Encourage the students by opening up a communications channel with them. c) Organize Get-togethers for children and their sponsors where they meet and share their experiences. 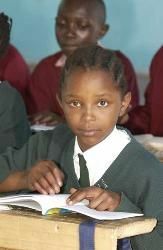 Reach The Children Kenya has been able to give text books and uniforms to needy students, priority being the ones that are about to sit for their Kenya Certificate of Primary Education. Reach The Children Kenya is in the process of creating and pioneering a school to school program initiative in the rural areas whose objective is to create a linkage between needy rural Kenyan schools and better placed schools in the developed countries. a) This initiative will involve parents, teachers, students in the selected community, with schools found in the USA community. b) The initiative will extend its activities from the school to the community around the school. c) Provide avenues for correspondence between the two communities to enable the communities exchange information and experiences and thus learn from each other. d) Declare war against ignorance and poverty by discussing income generation for the school, community and the problems and constraints experienced, provisional recommendation and solutions given. e) Empowerment of the community through training to improve leadership and social economic components of the community. This includes development planning. Planning for the community and observe their increased role in planning at grass root level to ensure proper implementation, Monitoring and Evaluation. Under this initiative Reach The Children tries to assist schools that are in a dilapidated condition and children practically have no classrooms. Reach The Children will only be able to take up the project if there is support from the community. We also provide learning materials and school supplies that we may receive through donations to schools that are in need. However the schools would be required to do an activity for example a clean up exercise or a more innovative exercise before being given some of the supplies. When funds are available Reach The Children also tries to assist Kindergartens and primary schools with their feeding programs. Children without proper health care may receive vaccinations and inoculations. Some of the orphans who have dropped out and are too old to go to secondary school are provided with vocational training. At the moment Reach The Children has been able to assist some older orphans learn tailoring and dress making skills.